Right now, you’re probably in a jacked up situation and life doesn’t seem fair at all. Folks may be kicking you while you’re still down, they may be lying on you, and they may be making your life pure hell. You may be dealing with trauma from your past. You may be facing foreclosure. You may be dealing with a terrible divorce or bad break up. You have EVERY right to feel angry, sad, depressed, defeated or any other emotion you’re feeling. However, if those feelings are STOPPING you from moving forward in your life…then that’s not good or helping you to change your life for the better. Here’s the thing, in life what matters most is HOW YOU RESPOND to what’s happened to you, not necessarily what has actually happened to you. My child support case is a perfect example of this. I was homeless and had no money when my son’s father won a child support case against me. The judge did not care that my son’s father was a millionaire, that I didn’t even have a job, or that I was homeless. The judge ordered me to pay up anyway. People advised me to fight this because I didn’t have the money and my ex was being spiteful. I was tempted to do so, but I decided to pay up. But how??? I literally had no money coming in to pay. I couldn’t find a job either. A part of me wanted to show my ex that I would not be defeated and could pay. I even committed myself to paying my child support every month on time. But how, right? I didn’t know how, but I learned the power of making .a commitment. I knew that a way would be made. I also knew that if I didn’t pay up I would end up in jail. And… I was NOT trying to go to jail. I couldn’t stay in victim mode. I had to own my situation no matter the circumstances. By owning my situation, I was able to take back my power. I was able to be creative and see possibilities. One day I asked myself how I would handle these support payments. The answer came to me: sell your old broken down car. I did and was able to pay off all of my arrears payments and get caught up on payments. To this day, I haven’t missed a payment in 4 years and I owe no back payments!!! SUCCESSFUL PEOPLE don’t blame other people for what’s wrong in their lives. Granted, other people may have caused or played a role in what’s wrong, but SUCCESSFUL PEOPLE take ownership of where they are in their life or business. If you find yourself blaming someone else for why you are not further along in your life… YOU MUST STOP THIS. Step 1 is all about helping you to get back in control of YOUR life. Do you like what you see or are experiencing in your life? Do you realize that you helped to create it? Would you like to change? If you answered “YES” to all of these questions, then you are on your way to changing your life. Realize that the same way you created the mess you’re in, you can create a better situation. YOU HAVE THE POWER TO DO SO. In life we are so used to blaming others for why we come up short. Blaming others helps us to justify our position. Victims and losers do that, but not us. We are becoming our own rescue and owning our stuff, right? A good friend helped me to realize how much I made excuses in my life. One day he told me to have an “EXCUSE FREE” day. I was like… what is he talking about? Is he crazy?!? I tried it and guess what… he was right! For the next 7 days, I want you to not make ANY EXCUSES for where you are right now in your life. NONE. For example, if you are late to an appointment because the bus, train, or Uber is late… don’t blame the train, bus or Uber driver. Nope… you’re going to have to eat the fact that you’re late and all of its consequences. This little exercise will work wonders. Using our example from above, you will do everything in your power not be late again. You’ll take personal responsibility to be on time and not leave it in the hands of the bus, train or Uber. By the end of this week you will have raised your standards and started flexing your dignity muscles. 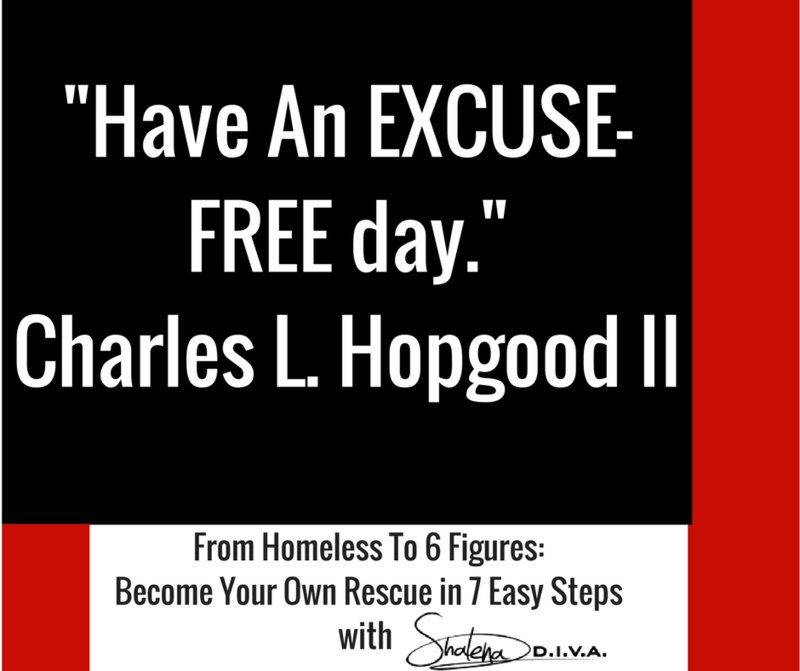 P.S.-This journey is just a taste of how you can radically change your life and business inside of Homeless To Six Figures Course. Discover every step you need to quickly and easily turn your smarts into profit and positive impact inside the program. Check it out here – the price is doubling in just a couple weeks.